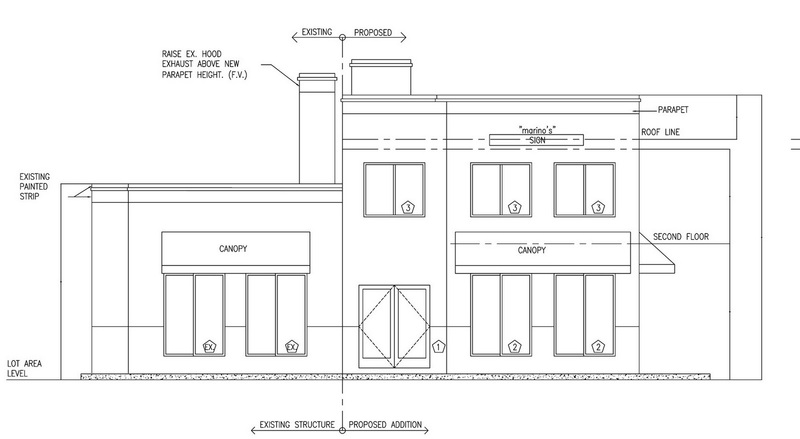 Marino’s Pizza and Subs, the carryout Italian food restaurant located on Jefferson Davis Highway at what would be Wesmond Drive, has applied for a special use permit to expand their footprint into a new, two-story sit-down restaurant attached and adjacent to the current location. Two members of the City’s urban planning staff, Jim Roberts and Katye Parker attended the January meeting of the Lynhaven Citizens Association to describe the project and hear feedback from the neighborhood. Jim and Katye explained that the new restaurant is proposed to have 72 seats which requires a minimum of 18 parking spaces. 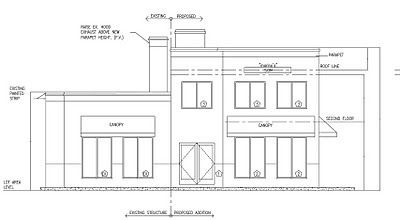 Marino’s, with some modifications of their current parking lot will provide 13 parking spaces, one of which the city requires for deliveries. The owners have entered into an agreement with Inturias Auto across Wesmond for six additional parking spaces to be used in the evening. The carryout combined with the restaurant will have a total of six employees and continue the same hours of the current establishment: open until 1:00 a.m. on weeknights and 2:00 a.m. on Friday and Saturday nights. Toward the end of the conversation, the engineer on the project introduced himself and clarified that the new sit-down restaurant will operate like a buffet rather than with table service and menus. Trash: There are already concerns about trash in the neighborhood generated by patrons of Marino’s. Many were concerned that with an expanded restaurant, trash would become worse. Hours of operation: Although the current carryout operation is open late at night, there were concerns among many present that the new format of the sit-down restaurant should not be allowed to operate until 1:00 and 2:00 a.m. Parking: The largest concern was about parking. Many were concerned that the city-mandated 18 spaces did not seem like enough to support both the carryout and sit-down restaurant. The agreement with the neighboring auto repair shop is a good effort to minimize the parking impact on Lynhaven streets, but many were worried about the sustainability and permanence of that agreement. Finally, there was concern that the restaurant hasn’t considered that their six employees will need to park somewhere and the most likely place will be in our neighborhood. Not all the comments were negative. Some suggested that the new sit-down format will lead to less trash in the neighborhood because people will be more likely to dispose of their trash there then to take it with them. And following the meeting, some wrote to express support of Marino’s as a small business looking to expand in tough economic times. As a result of the conversation, Marino’s agreed to postpone their Development SUP application one month to allow for some time to further talk to the neighborhood (here is the March 1 Planning Docket showing this item). They and the city staff will attend the February meeting of the Lynhaven Citizens Association, scheduled for Monday, February 7th at 7:00 p.m. at Cora Kelly Rec Center. Comments can be sent to Joe Bondi, LCA President at joebondi@gwu.edu, or to the city urban planners on the project, Jim Roberts (James.Roberts@alexandriava.gov) and Katye Parker (Katye.Parker@alexandriava.gov). In its current state, Marino's is a bit of an eyesore and an inefficient use of space. A redesign could help make it a neighborhood staple. The fears over parking aren't any more or less than the Mt. Vernon restaurants, many of which are walkable from Lynhaven. Worse comes to worse, we'll have a permit parking situation (I'd like to avoid that, but it isn't catastrophic). Bottom line, we should encourage development of businesses that want to be a part of our community.